George Plunkett's photograph, on the left, shows this church on the eve of the Second World War, set in the maze of narrow lanes that interspersed the courts between St Benedict's Street and Pottergate. These days, this area is the heart of alternative Norwich. St Benedict's Street itself is a part of the old city that has mostly survived; fine Victorian and Edwardian two and three storey buildings front the street, with much older ones huddling in courtyards behind. They came very close to not existing, as we shall see. Today, St Benedict's Street's old fashioned pubs, gay bars, second-hand record stores and comic shops are refreshing after the stultefying glossy commercialism of the new Chapelfield shopping centre. But it had a different feel five hundred years ago, as you can tell from the fact that in its 500-odd metres there are five medieval churches. All of them are redundant now, of course; St Laurence is one of Norwich's biggest, St Gregory probably its most interesting, St Margaret is used for exhibitions and St Swithin is the excellent Norwich Arts Centre. But it is the most westerly, St Benedict, which proudly gives the street its name. It once gave its name to a gate in the city walls, as well, and if you stand at the end of St Benedict's street you can see remains of the walls. But you won't see much else, because one night in January 1942 this area beyond the street to the west was carpet-bombed by German planes, and the parish was almost entirely destroyed. All that remained of St Benedict was the shell of the aisle and the ancient round tower, standing tall and defiant. 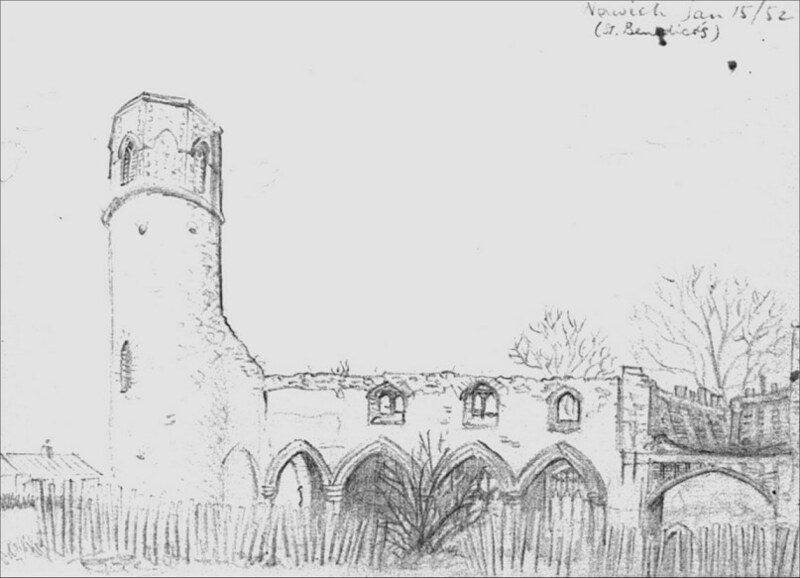 Robert Tuck was passing the ruin on January 15th 1952, and sketched the image you see to the right; the south wall has gone completely, and you see the north arcade, clerestory and aisle from the inside. It isn't clear how much medieval had survived to be bombed anyway. 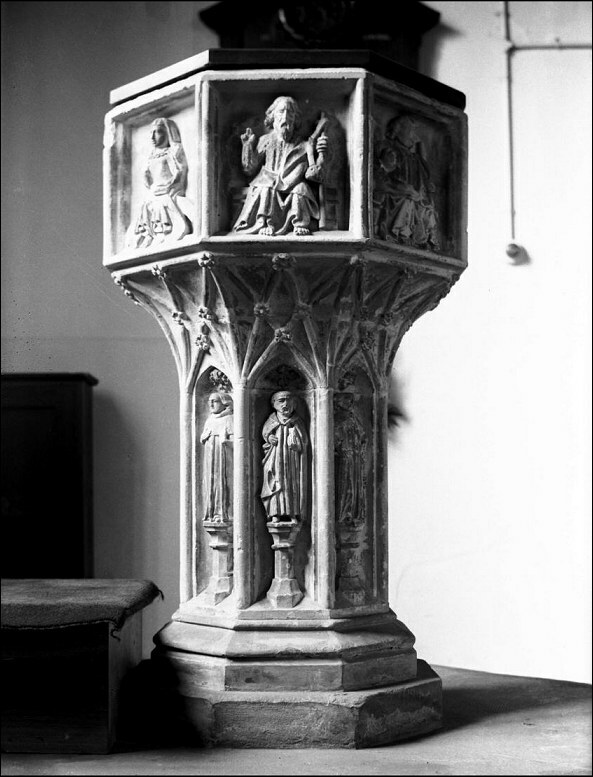 There was a fine font, which you can see in some more of George Plunkett's photographs below, and I assume that this was smashed by the bombers. But other than this, Spencer and Kent recall that St Benedict underwent two major 19th century restorations; in 1869 it was repaired and reroofed, but by 1896 it had become 'delapidated and dangerous', the arcade to the single north aisle being replaced with cast iron columns, which you can see in George's photographs and Robert's drawing, unnaturally exposed. 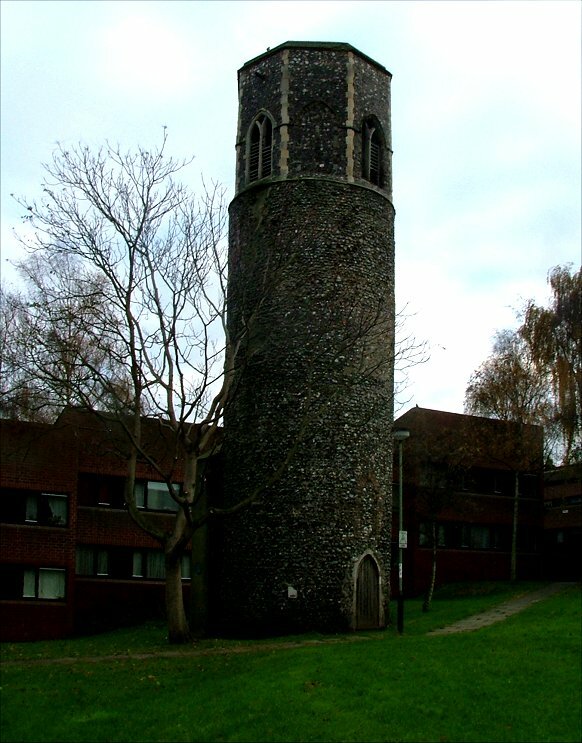 This essential yet ultimately futile repair was probably a symptom of the neglect that was inevitable when Norwich's many churches had such tiny congregations. 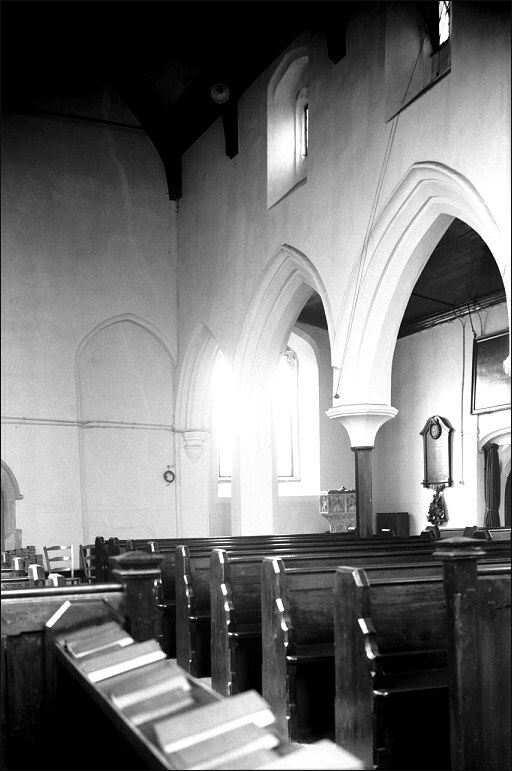 The parish was also tiny - surviving Ten Bell Lane to the west was actually in St Swithin parish - and like St Gregory at the other end of the street, St Benedict was accessible from both Pottergate and St Benedict's Street, its graveyard stretching between the two. 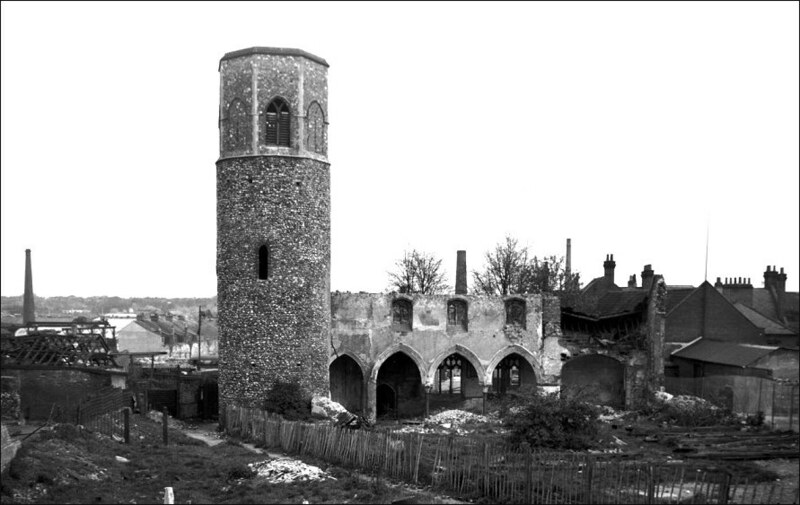 In the years after the War, the rubble was cleared, and the remains of St Benedict were removed, apart from the round tower. 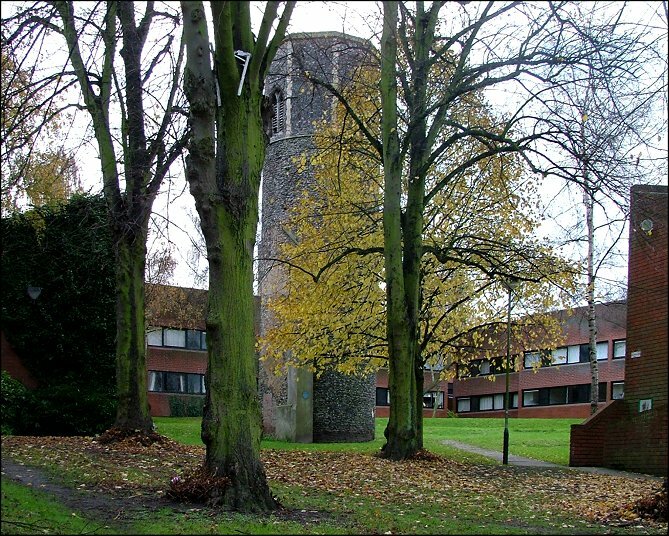 The City Council's award-winning 1980s Pottergate housing scheme used the tower as a focal point, creating around it a courtyard of two-storey red-brick housing, with an entrance to the courtyard through the former churchyard trees. It is an excellent assemblage, a little like a university campus. You need to look again at the first of George Plunkett's photographs, however, to see how utterly this setting has changed from what was there before. In an odd kind of way, St Benedict was actually rebuilt. 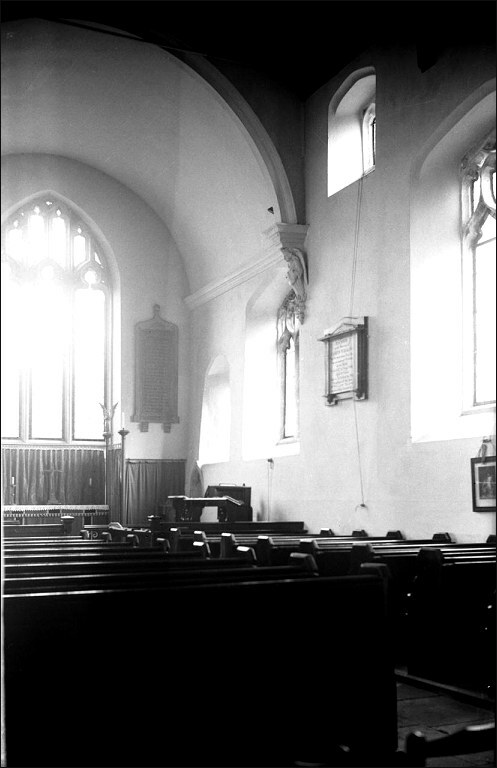 The system of compensation after the war meant that the Diocese of Norwich was paid war reparation money for this church, as long as it was spent on reconstruction. 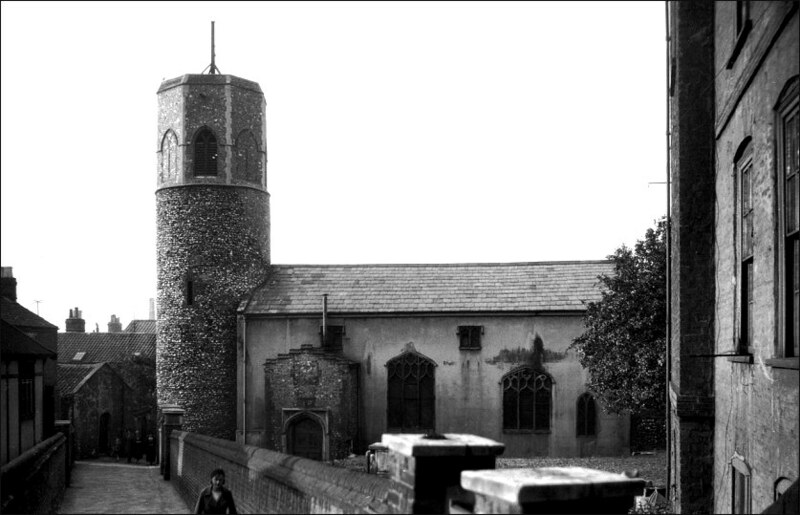 However, it did not have to be on the same spot, and so the new St Benedict opened in 1956 where the need was greater, in the middle of Lowestoft on the Gunton estate. The bell from the Norwich church tower was rehung in the new church. It is actually in Suffolk, and you can see what it looks like on the Suffolk site. 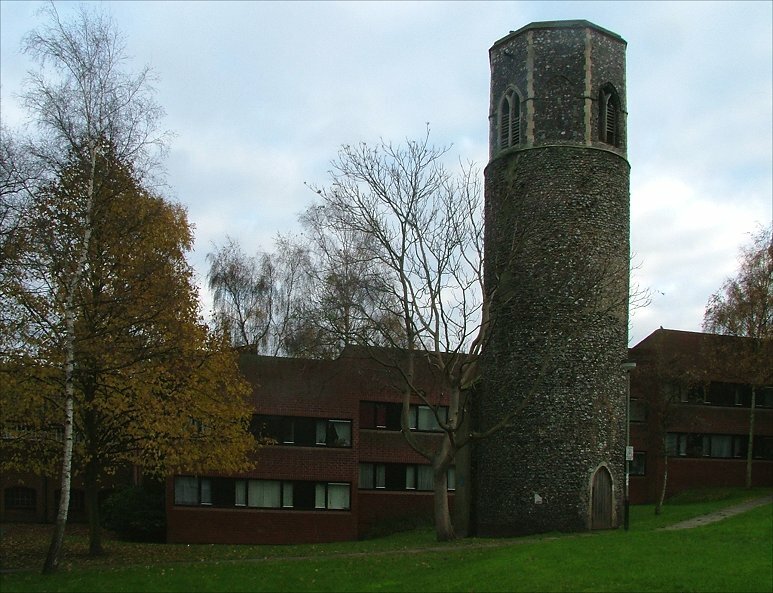 A fine new church in Suffolk, and an excellent housing scheme around the ruin here, are not matched by the other side of St Benedict's Street, I am afraid. Here, the cleared rubble gave way to a car park, and in recent years this has been replaced by vast Toys R Us and TK Maxx hypermarkets, those churches of the modern age, and a rude awakening after a pleasant stroll along St Benedict's Street. Perhaps our planning policies today are not as demanding as they were in the 1950s and 1980s.